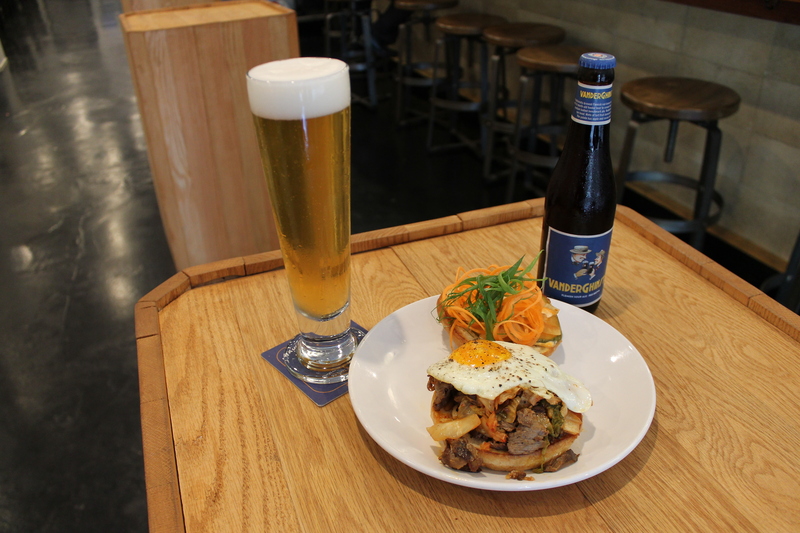 There are a few meals that are infinitely better when paired with a beer. Pizza comes to mind and so do burgers. In my opinion, you shouldn’t drink anything other than a beer with either of these foods. With that in mind, I paid a visit to our local burger and beer palace, Square Barrels in Downtown, to come up with some fun and delicious beer pairings for a number of their burgers. 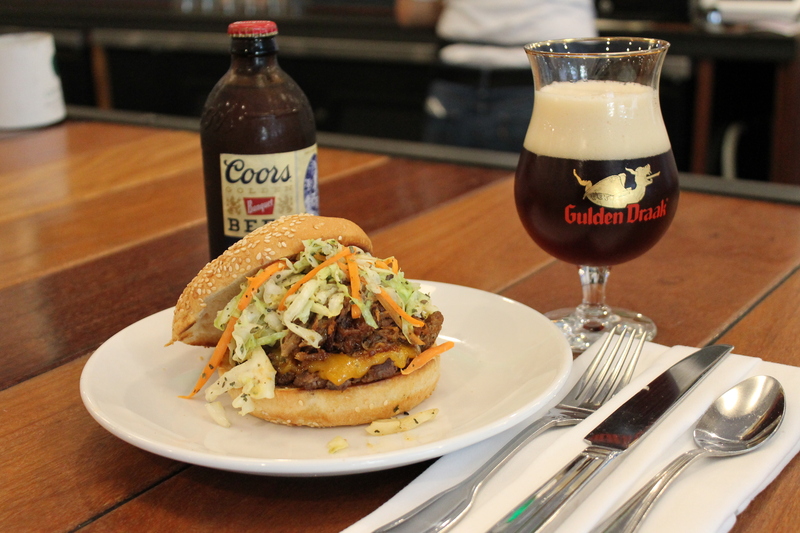 The beauty of pairing a beer with a burger is that you almost can’t go wrong with what you choose. The options are endless, but along with Square Barrels owner Hideo Simon and Bar Manager Thomas Ray, we focused on 2 different beer styles for five of their unique burgers. 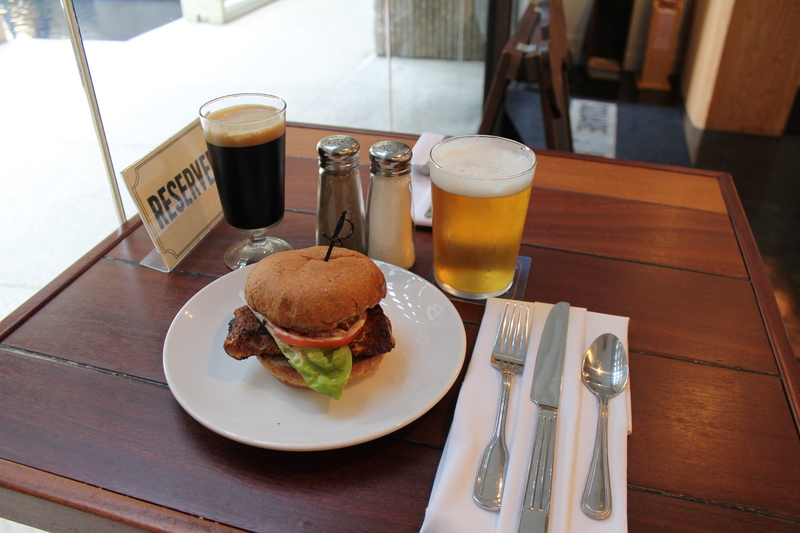 Beer’s carbonation is the key to making it the perfect beverage to enjoy with a burger. Any meat based burger is going to have a fair amount of fat and a lot of richness. This is what makes a burger so tasty and it’s why beer’s carbonation is so important. The C02 in beer helps cut through the fat and scrub your palate. Combine that cleaning effect with beers wide array of flavors that can compliment any burger and you have the perfect pairing. The following pairings are just a starting point. These styles pair up nicely with each burger and practically any beer within the style would work. Be adventurous and try out some different pairings for yourself. First up was Square Barrel’s signature burger the, Drive-Thru Burger. The classic American burger is made with freshly ground Big Island beef, lettuce, tomato, pickled onion, fried caper mayo and served on a sesame bun. You can add cheese (gooey American is a must) to add even more richness. Pair with an American Pale Ale (pic Sierra Pale Ale) or California Common (pic Anchor Steam). A touch of malts and a touch of hops is what this beer needs. Steer towards Pale Ales that have a bit more balance between malts and hops instead of ones that are overly hop forward. The moderate bitterness of both an APA and a Cal Common will help cut through a lot of the fat while bready, slightly sweet malt base will compliment the bun and caper mayonnaise. The Barbie Burger is a recent addition to the SB menu and it’s the type of big, over indulgent burger that begs for a beer. A thin crispy burger patty is covered with smoked pulled pork and topped with cheddar cheese, creamy coleslaw and then slathered with bourbon bacon bbq sauce. Everything is done in house, from smoking the meat to the homemade bbq sauce and fresh made slaw. A burger this intense can actually be paired with a relatively light beer like an American Lite Lager (pictured Coors Banquet Beer). The idea here was to keep it simple and let the burger do all of the talking and the beer be clean and crisp. A light American style lager works here because it has a low bitterness and a soft cracker like malt flavor which won’t over power the beer. If you’re looking for a more flavorful experience then Belgian Triple Or Dark Strong Ale (pic Gulden Draak) is the way to go. This matches power with power, elevating the overall flavor of the burger. The slightly sweet notes of a Triple or Dark Strong compliment the bbq sauce and coleslaw, while the high carbonation helps cut across all of the burger’s intense fat. With so many complex flavors going on in this burger a simple German Pilsner (pic Maui Pau Hana Pilsner) works perfectly here. Korean food goes so well with a light and crisp Pils, but here we can replace the traditional HITE with something with a bit more flavor. Clean, snappy and refreshing is what were looking for here and Pau Hana Pil’s gentle bitter finish helps clean away the spice, fat and kim chi sour funk with each sip. To match flavor with flavor try something with a bit more funk like an Oud Bruin (pic Vanderghinste Oud Bruin). This Belgian style brown ale is moderately sour with pungent plum fruit aromas and a slight sweetness. The combination of sweet and tart pair up incredibly well with the funky kim chi and savory gochujang mayonnaise. Next up is the Ahi Fillet Burger, ergh…sandwich. Hey we’re in Hawaii, how can you not have a fish burger on the menu. This sandwich starts with super fresh blackened ahi fillet from the fish auction (cooked medium) and then it’s topped with lettuce, tomato, pickled onion and a house made cilantro tartar sauce. The blackening on the fish gives it a nice char that is perfectly balanced by the tangy pickled onion and creamy tarter sauce. The lettuce and tomato keep things bright and fresh. With a fish sandwich you can actually go light or dark. 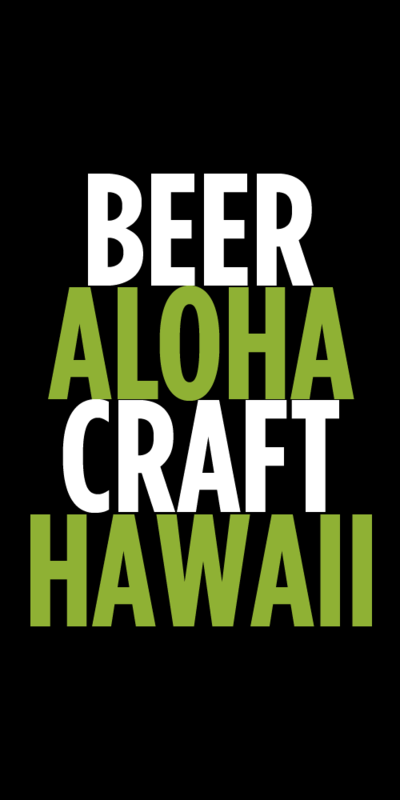 Stick with something light like a Munich Helles Lager (pic Maui Bikini Blonde) to let the ahi and spices shine through. A Helles is a touch less hoppy than a Pils and will have more of a malt sweetness. Or go for something darker that complements the blackening spices like a rich, dark Porter (Heretic Shallow Grave). Shallow Grave is a great option because it has a touch of smokiness that accentuates the burnt crust on the ahi. Ok, I admit I’ve never heard of an Eland. Had no clue what it was. But I sure do love Eland Bacon Burger. Quick Google search to discover that it’s sort of like an antelope and who knew that they raise them on Ni’ihau! The locally raised Eland (which is pretty similar in taste to venison) is freshly ground and the grilled patty is topped with bacon, Gorgonzola cheese, lettuce, tomato and pickled onion. Eland is very lean so it needs a some fat to give it more richness (as if you ever need an excuse to put bacon on a burger.) 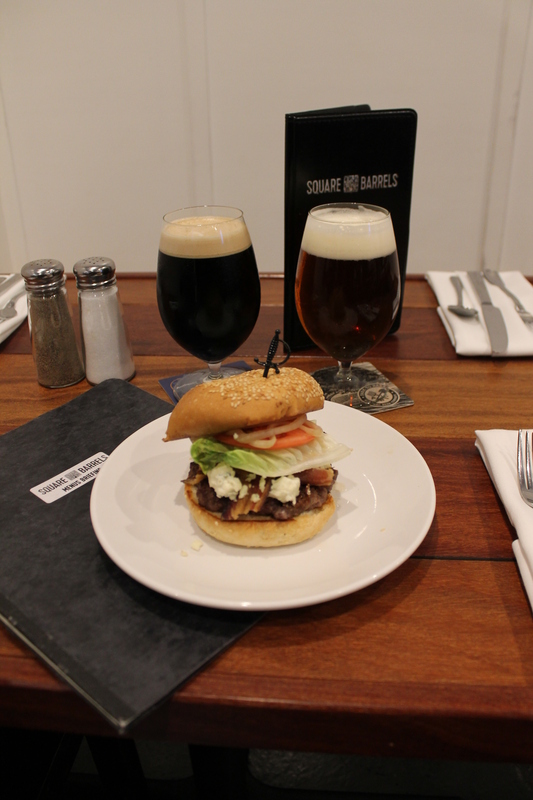 The Eland burger is big, rich and full of flavor and needs beers that can handle rich bacon fat and creamy gorgonzola. I suggest sticking with beers that are 8% abv or higher like an Imperial Stout (pic Old Rasputin Russian Imperial) or a Double IPA (pic Deschutes Hop Henge). The combination of a touch of sweetness with dark, roasty hints of coffee, chocolate and tobacco from Old Rasputin stand up to all of the bold fatty flavors of the burger, yet they also make the pungent cheese almost seem creamier. 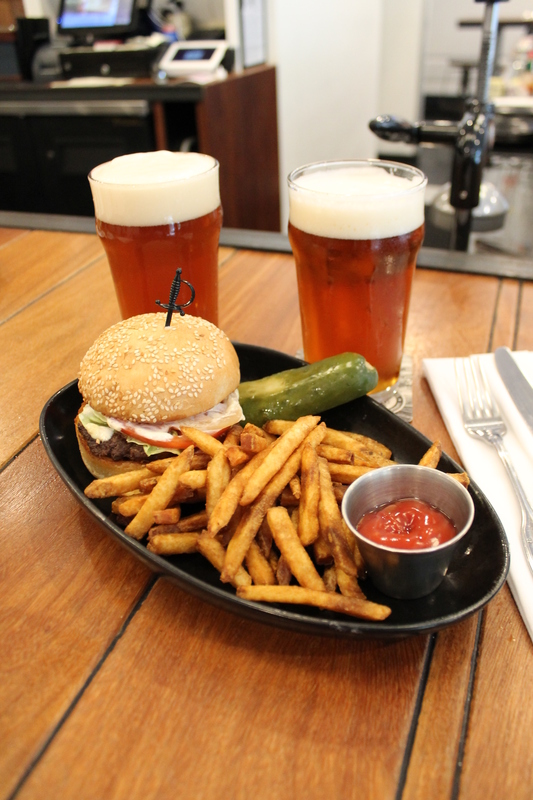 The high alcohol helps keep the beer balanced with the intense flavors from the burger. A lighter, lower in alcohol beer would too easily get lost. A Double IPA also works really well here. The intense hop flavors, along with a bit more malt sweetness than a regular IPA hold there own next to the meat and cheese. Go for an DIPA that has a bit more hop resin flavors than one that is overly fruity (think Simcoe, CTZ, Centennial over Mosaic). The dank bitterness will help cut through the layers of fat and flavor. Tags: Beer and Burger, Beer Pairing, Square Barrels. Bookmark the permalink. Right on. 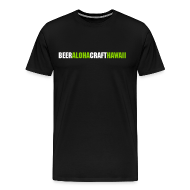 I’ll be heading up social media for Square Barrels in a week or so and I would love to connect with you and talk about doing some cross-promotion.